Graphic designer and Type Tasting founder Sarah Hyndman has been finding ways to make typography fun and exciting for a mainstream audience for years. 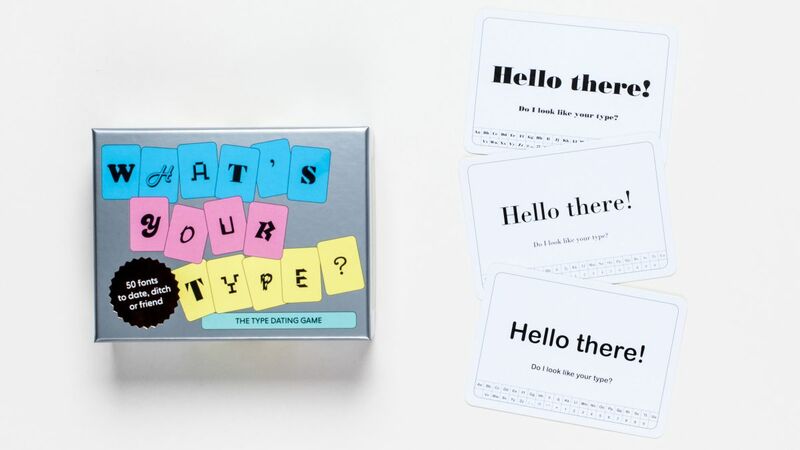 Previous explorations have looked at how fonts taste and feel, but for her new type psychology dating game, What’s Your Type: The Type Dating Game, Hyndman has started a conversation using a language we can all understand: the language of love. Designed to test how type-savvy you are and to help players understand type in a totally new way, What’s Your Type is a new card game from Laurence King Publishing that explains font ‘personalities’. Players can choose from four different styles of play, including a typographic twist on the ever-popular ‘snog, marry, avoid’. The set includes 50 cards, each featuring a different font. By making a selection, or turning down an unlucky typeface, players find out about what attracts them to a certain style, and even what their choice says about their character. It’s a whole new way to think about font pairings. To test her theory, Hyndman created a font census based on the results of online surveys. And while she discovered that most people do indeed see personalities in typefaces, she was surprised to learn that, for the most part, we all project similar identities into them. There are, of course, exceptions to the rules. “When I first started to look at the results I was perplexed to see Bauhaus described using words like ‘silly, a clown, friendly, doughnuts’,” Hyndman explains. What’s Your Type is more than just a fun way to essentially swipe left or right on typefaces though. Each card details the top three personality traits for a font, so they also help designers decide on an appropriate typeface for their project.